In the last two decades, there has been widespread application of the term "indigenous" in relation to various groups worldwide. However, the meaning of this term and its uses tend to be inconsistent and variable. The expression derives from the interaction of different cultures—the meeting between the original inhabitants of a specific region (known variously as "first nations," "natives," "indigenes," or "aborigines") and new, foreign "settlers" or "colonizers," who imposed their alien value systems and way of life on the indigenous populations. In Israel, the indigenousness claim has been raised over the past few years by the country's Bedouin citizens, a formerly nomadic, Arabic-speaking group centered in the southern arid part of the country, the Negev. They argue that Israel denies their basic indigenous rights such as maintaining their traditions and owning their own lands. Does this claim hold water? What are its implications for Israel as well as for other nations? 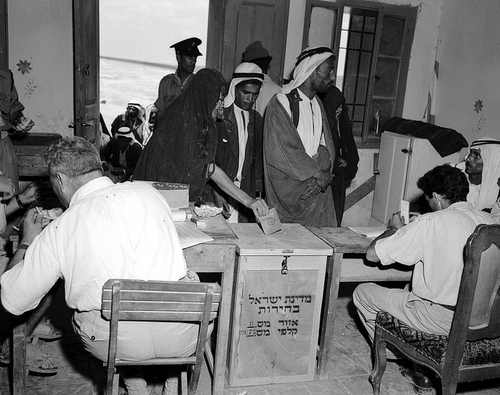 Bedouins vote in the 1951 elections for the second Knesset. While the Negev Bedouin may be at the lower end of Israel's socioeconomic strata, attempts have been made since the beginnings of the modern state to incorporate and integrate them into Israel's multiethnic society. What is known today as international law developed in Europe from the seventeenth century onward, parallel to the emergence of sovereign nation states, with the objective of regulating relations between these new entities. Traditionally, international law made no mention of group rights, which were considered a domestic concern of the state. International law was reluctant to further group rights for several reasons, among them concern for the integrity of the state and fear of separatism that would undermine its stability. Furthermore, group rights were considered contradictory to the concept of a modern state based on a direct social contract between the citizen and the sovereign. Over time, however, the idea of group rights for indigenous groups began to emerge. Indigenous societies claimed that their position was unique in view of the great damage to the independent political frameworks that they had maintained from time immemorial, their subjugation to a regime and lifestyle alien to their culture, and the limitation of the physical area in which they were forced to live. Their case, therefore, centered on revoking this perceived injustice and included demands to preserve sacred sites, traditional crafts, and customs as well as to honor preexisting treaties to the extent that such had been signed. These societies also insisted on their right to self-determination whether in the choice of group members or in the wider sense of sovereignty. The rights demanded were on behalf of the indigenous group and its common and collective character. As far as the European colonizers were concerned, legal rights vis-à-vis both preexisting populations and other colonizing nations were based on the doctrine of "discovery." This maintained that sovereignty over and full ownership of a territory belonged to the nation that discovered the new land. This doctrine was upheld multiple times by the United States Supreme Court in the nineteenth century, and courts of additional nations followed suit. In Australia, the British Crown used the argument of terra nullius (empty land, namely an unoccupied territory with no sovereignty or recognized system of rights) to justify its classification as crown land. However, beginning in the eighteenth century, it was conceded in courts of various states that the population that lived in a territory before the advent of the Europeans did possess rights. Legal arguments focused on the question of whether, prior to the arrival of the colonizers, a system of land rights already existed in a specific territory that had to be taken into account, and if so, in what manner. Early attempts by indigenous peoples to bring their case before international forums began in the 1920s. Their first successes, however, came decades later when activity shifted from domestic arenas to regional, and later, international organizations. On the international level, the issue of indigenousness was advanced in three major frameworks. The first comprised two covenants adopted by the International Labor Organization, an affiliate of the United Nations: the Indigenous and Tribal Populations Convention of 1957 (No. 107), and later, the Indigenous and Tribal Peoples Convention of 1989 (No. 169)—neither of which was successfully implemented. The second framework consisted of the efforts of organizations such as the World Bank, which since the 1990s, began to list indigenous rights as an issue of concern in its dealing with countries, especially in the Third World. The third framework was informal action within various forums of the U.N. dealing with human rights. This included initiating conferences and promoting study of the topic. Beginning in 1971, the U.N. Economic and Social Council (ECOSOC) conducted an extensive study of the issue of native populations. Carried out over a period of about ten years, the research was published in a series of reports submitted between 1981 and 1986. In 1982, the U.N. Working Group on Indigenous Populations was established, charged with protecting native populations and the development of international standards relating to their rights. A draft Declaration on the Rights of Indigenous Peoples (DRIP) was enjoined in 1985, and almost twenty years later in 2006, was finally submitted to the U.N. General Assembly and approved the next year with the support of more than 140 nations. Four nations that voted against it (the United States, Canada, Australia, and New Zealand) eventually withdrew their opposition. Israel did not participate in the voting. During this time, the assembly declared 1995-2004 to be the "International Decade of the World's Indigenous Peoples" and established a permanent forum on this issue within the framework of the Subcommission on Prevention of Discrimination and Protection of Minorities. The assembly declared a second decade on December 20, 2004. Much of the delay in presenting DRIP centered on differences of opinion related to the concept of sovereignty as well as the definition of indigenous. Since no consensus was reached on this crucial definition, the problem was circumvented by deleting it from the draft. Numerous countries, mainly from Asia and Africa, made qualifying statements regarding their support for the declaration. Indonesia for example, with its hodgepodge of ethnicities and languages, argued that "the rights in the Declaration accorded exclusively to indigenous people and did not apply in the context of Indonesia." A more restricted view of indigenousness had been articulated as early as 1999 by Miguel Alfonso Martinez, then special rapporteur of the U.N. Working Group on Indigenous Populations. His view is consistent with a concept that indigenousness is relevant to countries where there is a "two-stage model" of first inhabitants and colonizers and is less relevant or completely irrelevant in an environment of multistage historical development. The final version of the Declaration on the Rights of Indigenous Peoples, adopted in 2007, also did not include a definition of an indigenous people, mainly because the relevant U.N. bodies were unable to agree on the matter. This has contributed to the low level of de facto implementation of the declaration among U.N. member states. Despite the absence of a universally accepted definition, DRIP manages to shed some light on the question of what an indigenous people is: a separate political entity with unique characteristics within the framework of the state. According to its articles, such entity or nation has the sovereign right to determine the structure of its institutions, its identity, and its membership. Moreover, the declaration differentiates between rights accruing to individuals and to the collective body; articles dealing with land rights refer only to the rights of indigenous peoples as a collective body, not as individuals. Original inhabitants: Indigenes are descendants of the people who were first in a particular territory. Time duration: Indigenous people have lived on the land "from time immemorial"—thousands, and even tens of thousands of years. The Australian aborigines, for example, have lived in their territory for anywhere between 40,000 and 60,000 years while Native Americans claim a history of thousands of years. Another related attribute is that indigenous people were on the land before newcomers arrived. Experience of oppression by a foreign culture and legal regime. While many groups may sense having being oppressed, oppression in this context refers to "colonialism or something like colonialism." Group attachment to land: Indigenous peoples maintain a unique, common relationship of a spiritual nature with the land on which they live or have lived. This is often reflected in the belief that land is a gift to that people from God. Separate customary, cultural, economic, social, and political institutions. Self-identification and recognition by others as indigenous. An important differentiation between indigenous peoples and minorities is connected to those parameters that relate to the historical dimension such as "first nationhood" or former (i.e., pre-colonial) sovereignty on the soil. While such a distinction has recently been challenged (primarily by groups in Africa for whom proving the historical connection is problematic), it is important to maintain the difference. In fact, a crucial differentiation between minority rights and indigenous rights is that minority rights are formulated as individual rights whereas indigenous rights are collective. This distinction, as well as the articles incorporated into DRIP, has a particular relevance to the claims of the Negev Bedouins. In the past few years, the Bedouin of Israel's Negev have begun claiming the status of an indigenous people, arguing that Israel like other colonialist regimes dominated their territory, refused to admit their lengthy presence in their native land, and denied their rights. This line of argument is consistent with the position of the Arab leadership, voiced as early as the early 1920s, that disparaged the Jewish national revival as an alien, colonial intrusion into the pan-Arab patrimony. These arguments are both erroneous and misleading. To begin with, the Bedouin are by no means the only people who can lay claim to the notion of being a "first people" in Palestine: Jewish attachment to the land predates Arab presence there by millennia. Indeed, of the countless groups that have lived in Palestine since antiquity, Jews are the only nation that can claim an uninterrupted presence on the land from biblical times to date—for a significant amount of the time as its rulers. About three millennia ago, a kingdom of Israel was established in the landmass from the Negev in the south to the Golan Heights in the north. At one stage, it was split into two kingdoms: Israel and Judah. The northern kingdom of Israel was conquered by Assyria in the eighth century B.C.E., and a portion of its population was exiled. The southern kingdom of Judah, which exercised sovereignty over the Negev, continued to exist until it fell in the sixth century B.C.E. to the Babylonians, who exiled a considerable segment of the populace. The Babylonian Empire was soon, thereafter, conquered by the Persians, who allowed the exiled Jews to return to their homeland in 538 B.C.E. In addition to the returning Jews, the land was peopled at this time by Idumeans (Edomites), the remnant of the Philistines, Samaritans (a mixture of Israelites and Assyrian colonists), and some Arab groups, likely the ancestors of those who would come to be called the Nabateans. Over the course of approximately four centuries, the country was under the control of various non-Jewish rulers, but from 141-63 B.C.E., the sovereign Jewish kingdom of the Hasmonean dynasty was established, eventually falling within the sphere of Rome, which ruled it with some minor hiatus for the next seven centuries. With the Muslim conquest of the seventh century C.E., there began an increased movement of Arab tribes into the area. Over the next nine centuries, various foreign Muslim and non-Muslim occupiers controlled the land, culminating in the Ottoman conquest in 1517. Since its advent in the seventh century, Islam constituted the organizing principle of the sociopolitical order underpinning the long string of great Muslim empires. Islamic principles became the framework that brought Arab tribes together, served as a unifying force for social organization, and invested the empire with political legitimacy with the sultan-caliph recognized as the religious and temporal head of (most of) the world Muslim community. Tribal lifestyle and customs also became an integral part of the systems of government and law. Courts were established throughout the empire that passed judgment according to Shari'a (Islamic law), an Ottoman land law formalized in 1858, and other civil jurisprudence codified in 1876 as the Ottoman Mejelle. During World War I, Britain took control of the land and in 1922 was appointed the mandatory administrator for Palestine by the League of Nations with the specific goal of facilitating the establishment of a Jewish national home in Palestine as envisaged by the Balfour declaration. The British Mandate in Palestine continued utilizing most of the existing Ottoman legal system, including laws related to land. With the establishment of Israel, the Provisional State Council (the temporary parliament antecedent to the Knesset) enacted the Law and Administration Ordinance of 1948 that maintained the existing legal system with its roots in Ottoman law. Thus, in contrast to colonies in which Western powers imposed a foreign legal system, in Mandate Palestine, and later Israel, the judicial system that developed over the years was grounded in the norms of tribal life and the Muslim population. More important, neither the British nor the Israelis considered the land terra nullius to which the old European doctrine of discovery applied for the simple reason that it was neither "empty" nor "discovered." As far as the Jewish people was concerned, Mandate Palestine was its ancestral homeland, and it was the general recognition of this fact that underlay the League of Nations' mandate for the establishment of a Jewish national home there. Ottoman tax registers demonstrate that the tribes which lived in the Negev in 1596-97 are not those residing there today. According to historians Wolf-Dieter Hütteroth and Kamal Abdulfattah, the tax registers that reflect material collected in those years show names of forty-three Bedouin tribes living in what became Mandatory Palestine, including six in the Negev. There is not much information on what became of those tribes. However, the names of the tribes currently living in the Negev do not appear on the tax registers from 1596. The Ottoman government did not maintain reliable records for this area after 1596, so these registers are the best indicators of which tribes existed in the early Ottoman period. Clinton Bailey, a scholar of Bedouin culture, also found no evidence in the thirteenth and fourteenth centuries of the continuity or existence of Bedouin tribes, which later lived in the Negev in the eighteenth and nineteenth centuries. Are the Negev Bedouin Indigenous? Original inhabitants. Many groups preceded the Bedouin in Palestine in general and in the Negev in particular, including the Jewish people, which has maintained uninterrupted presence in the land since biblical times. Hence, the Bedouin can hardly claim to be the country's original inhabitants. Time dimension. This requires a lengthy presence in a territory—the so-called "time immemorial" parameter. But the Negev Bedouin have been there for only two centuries. Nor can they claim presence in the land before the arrival of the foreign power as the imperial Ottoman presence there predated that of the Bedouin by centuries. By contrast, the Jewish presence in Palestine fully corresponds to the "from time immemorial" parameter. Sovereignty. In the case of the Negev Bedouin, they were never sovereign in the area. When they arrived, the Negev was already under Ottoman rule, before coming under British, then Israeli sovereign authority. Oppression by a foreign culture and legal regime. It was, in fact, the Bedouin who imposed themselves on established settlers in the Negev, displacing them and destroying their villages. The Ottoman Muslim order, which they confronted upon arrival, was similar to what they had experienced in the other parts of the empire from which they migrated to Palestine. Britain was indeed a foreign power, but it never attempted to colonize Palestine as its presence there was transitory from the start in line with the League of Nations mandate. As for the Jews, far from being colonial intruders, they were descendants of the country's ancient inhabitants, authorized by the international community—as represented by the League of Nations—to reestablish their independence in the ancestral homeland. Unique spiritual relationship to the territory. While nomadic life, by definition, precludes permanent attachment to specific territory, pastoral lands do become a significant element in Bedouin life given their importance for tribal subsistence. Furthermore, even today, control of an area is a matter of honor among the Bedouin, and any challenge to this control, however legitimate or legal, is considered an insult. Nonetheless, there is no evidence of long-standing Bedouin traditions relating to the Negev, a logical situation considering their fairly short presence there and nomadic lifestyle, and they look to the Arabian Peninsula as their historical homeland. Moreover, the Bedouin are not currently asking for collective land rights, rather all their claims are formulated on an individual basis (overwhelmingly by males with almost total exclusion of women), demanding the right of individuals to sell land and transfer it to a third party. These private demands are not congruent with the spiritual dimension parameter and even contradict it, which leads to the conclusion that the main Bedouin aspirations are for private gain and have no real collective element relevant to a campaign for recognition as indigenes. A minority with an identity different from that of the general population. The Bedouin are, without doubt, a small minority in Israel, not only of the entire population but even within the country's Arab citizens. Indeed, until the middle of the Mandate period, the Bedouin were considered by the Palestinian Arab peasants as their enemies. Recently there have been signs of an abandonment of an independent Bedouin identity and the gradual adoption of a Palestinian Arab identity accompanied by increasing involvement in Muslim fundamentalism. A 2003 study concluded that the Bedouin should no longer be considered a "society unto themselves" and that their identity today is Palestinian Arab, lacking any common tribal element, and is in the process of being shaped anew. It further claimed there was an ulterior motive behind the long-standing categorization of a separate Bedouin identity: to negate the national Palestinian Arab identity. The last conclusion, however, flies in the face of historical evidence, ignoring the unambiguous Ottoman view of the Bedouin as a separate group, long before the advent of confrontation between the Arab and Jewish populations of Palestine. A group with separate economic, social, cultural, and political institutions. In the past, Bedouin tribes behaved as separate units with an accepted leadership in the person of tribal sheiks. Tribes had a system of customs that governed all aspects of life, and each of them was an independent economic and social group; occasionally several tribes would join together politically to form a confederation. Today, the situation has changed dramatically. Studies attest to a significant weakening of the framework that handled tribal affairs and of tribes' ability to come to decisions acceptable to all individuals. Institutions that formerly made decisions within the tribe or in intertribal relations no longer exist today. Customary law and values necessary when the Bedouin were nomads, such as mutual responsibility, are no longer relevant. It would seem that today one cannot speak of Bedouin tribes in the Negev, alone or in confederation, as an operational administrative framework. The end of nomadism and the transition to permanent settlements during the past century have done away with identification of the tribe as a separate economic entity. Today, every household has its own occupation as part of the general economy, and there is no universally acceptable authoritative leadership. Nor are there consequential political frameworks whose decisions are accepted by all even in areas that are of primary importance to indigenous peoples, such as lands. Decisions relating to land are taken only by individuals; any declaration in the name of the tribe or in the name of the Bedouin is, therefore, not legitimate. There have been no demands by individual Bedouins to subordinate themselves once again to an internal, independent tribal framework. The opposite is the case: The tendency today is to increase individual rights. Authority that formerly rested with the sheik vis-à-vis his tribe, including matters relating to land usage, was abrogated after members of the tribe claimed that such authority was superfluous and that the sheiks exploited it to further their own interests at the expense of ordinary tribesmen. Despite the disappearance of an authority to manage and operate tribal matters, and the absence of tribal political frameworks, specific customs and traditions continue to exist as part of Bedouin customary law, but mainly in certain spheres of personal and family life such as marriage and inheritance rights. The group identifies itself, and is viewed by others, as an indigenous people in the territory. As has been demonstrated, the Bedouin claim to indigenousness is very new, having been raised for the first time only a few years ago. Earlier studies did not report that the Negev Bedouin consider themselves as such, nor did the researchers make the claim that they were an indigenous people. Since Bedouin tribes in other Middle Eastern countries have never claimed indigenousness, the validity of this claim by the Negev Bedouin is doubtful. Are the Bedouin somehow indigenous only in relation to the Negev but not in their homeland—Arabia—or in other Middle Eastern countries in which they abound? Even parts of the same tribes as those in the Negev that live elsewhere, for example, in the Sinai, do not claim indigenousness in their countries of residence. Although there is no official definition of indigeneity in international law, Negev Bedouin cannot be regarded as an indigenous people in the commonly accepted sense. If anything, the Bedouin have more in common with the European settlers who migrated to other lands, coming into contact with existing populations with often unfortunate results for the latter. Moreover, rather than suffering an alien imposition on their indigenous way of life, the Bedouin migrated mainly from one part of the Ottoman Empire to another, governed by the same system of administration and legislation with which they were familiar and which the British and the Israelis have subsequently largely maintained. As clearly demonstrated, the Negev Bedouin do not presently prefer to be a separate and independent entity in various spheres of public life such as economic and political activities. Their aspirations are of an individual nature. They are not interested in maintaining nomadic traditions of collective ownership of lands for the maintenance of a collective community but rather in an exclusively male proprietorship that would enable Bedouin men to sell the land to others at their own discretion. No studies have shown the existence today of functioning, independent institutions in various spheres of daily life that could point to the Bedouin being an indigenous people. That no other Bedouin tribe in the entire Middle East has raised a claim to indigenousness raises questions regarding the motivations and authenticity of such an argument. Since the Bedouin in the Negev in some cases are from the same tribe as those found in neighboring countries, it is not logical that they can only be indigenous when they are on the Israeli side of the border. The entire question of indigenousness is particularly problematic with regard to Israel. The fear is that instead of providing remedies and established order, it will create new disputes. The Land of Israel has a dual history, marked both by constant waves of immigration and invasion by various peoples and uninterrupted Jewish presence in the land from time immemorial. The Jews have always considered the Land of Israel their national homeland, have lived in it as a sovereign nation in historical times, maintained at least a toehold there despite persecution, and returned to it time and again after being exiled. This spiritual relationship is also expressed in both Jewish daily prayers and Israel's Declaration of Independence. If the parameters and preconditions for indigenousness are made more flexible to include arrivistes like the Bedouin, surely Jews can also raise a claim to be the indigenous people in Israel, a land which they called home thousands of years before the Negev Bedouin. In such a case, it may also be expected that other ethnic groups, such as Druze, Christian Arabs, and Samaritans, would claim indigenous status. No doubt, this would add to confrontations already existing over control of land and the holy places. The concept of indigenousness was intended to help remedy past injustices by giving native peoples the means to preserve their separate identity, common lifestyle, and the customs of their past. The Negev Bedouin may be a poor and marginal sector of Israeli society, yet this does not transform them into an indigenous people. Havatzelet Yahel is a doctoral candidate at The Hebrew University of Jerusalem and an attorney in the Israel Ministry of Justice. Ruth Kark is a professor at The Hebrew University of Jerusalem. Seth J. Frantzman is a post-doctoral researcher at The Hebrew University of Jerusalem and a fellow at the Jerusalem Institute of Market Studies. The views expressed here are solely those of the authors. S. James Anaya, Indigenous Peoples in International Law, 2d ed. (Oxford and London: Oxford University Press, 2004), p. 3. Natan Lerner, Group Rights and Discrimination in International Law, 2d ed. (The Hague: Martinus Nijhoff Publishers and Kluwer Law International, 2003), p. 112; Robbie Sabel and Hila Adler, eds., Mishpat Benleumy (Jerusalem: Sacher Institute, 2010), p. 241. Lerner, Group Rights and Discrimination, p. 111; Borhan U. Khan and Muhammad M. Rahman, "Protection of Minorities: A South Asian Discourse," The European Academy of Bozen/Bolzano, Italy, 2009; Arif Dirlik, "Globalization, Indigenism, and the Politics of Place," New Bulgarian University, anthropology dept., accessed Feb. 23, 2011; Ruth Gavison and Tali Balfur, "Zhuyot Kibutziot shel Miutim," working paper, submitted to the Constitutional Committee, Sept. 13, 2005. Patrick Thornberry, International Law and the Rights of Minorities (Oxford: Clarendon Press, 1991), p. 335; Lerner, Group Rights and Discrimination, p. 115; Siegfried Wiessner, "Rights and Status of Indigenous Peoples: A Global Comparative and International Legal Analysis," Harvard Human Rights Journal, 12 (1999): 99. Robert J. Miller, "The Doctrine of Discovery," in idem, et al., Discovering Indigenous Lands: The Doctrine of Discovery in the English Colonies (Oxford: Oxford University Press, 2010), p. 2. Johnson v. M'cintosh, 21 U.S. 543, 5 L.Ed. 681, 8 Wheat. 543 (1823); Worcester v. State of Georgia, 31 U.S. 515 (1832); St. Catharine's Milling and Lumber Company v. the Queen (Canada, 1887); Mabo and Others v. Queensland (Aus. ), no. 2, AU 1992, 175 CLR1. Erica-Irene Daes, "Indigenous Peoples and their Relationship to Land," UNE/CN.4/Sub.2/2001/21, U.N. Commission on Human Rights, Geneva, June 11, 2001, p. 11. See, for example, "Western Sahara, Advisory Opinion," International Court of Justice reports, The Hague, Oct. 16, 1975, p. 12. State of the World's Indigenous Peoples, Secretariat of the United Nations Permanent Forum on Indigenous Issues, New York, p. 2, accessed Mar. 19, 2012. Indigenous and Tribal Peoples Convention of 1989, International Labor Organization, Geneva, June 27, 1989; Lerner, Group Rights and Discrimination, p. 112. "Operational Directive: Indigenous Peoples," The World Bank Operational Manual, 4.20, Sept. 1991, pp. 1-6. See, for example, Conference on Discrimination against Indigenous Peoples of the Americas, Geneva, 1977; World Council of Indigenous Peoples, Kiruna, Sweden, 1977; State of the World's Indigenous Peoples, accessed Mar. 19, 2012. "The Problem of Indigenous Population," ECOSOC Res. 1589 (L), 50th Session Supplement, no.1, U.N. Doc. E/5044, May 21, 1971, p. 16. Robert A. Williams, Jr., "Frontier of Legal Thoughts III: Encounters on the Frontiers of International Human Rights Law: Redefining the Terms of Indigenous Peoples' Survival in the World," Duke Law Journal, Sept. 1990, p. 676. Lerner, Group Rights and Discrimination, p. 115. Ha'aretz (Tel Aviv), Oct. 2, 2007. U.N. General Assembly resolution 48/63, New York, Dec. 21, 1993; U.N. General Assembly resolution 49/214, New York, Dec. 23, 1994. U.N. General Assembly resolution 59/174, New York, Dec. 20, 2004. Anaya, Indigenous Peoples, p. 97. Sarah Pritchard, "Working Group on Indigenous Population: Mandate, Standard-setting Activities and Future Perspectives," in Sarah Pritchard, ed., Indigenous Peoples, the United Nations and Human Rights (London: Zed Books and Leichhardt: Federation Press, 1998), p. 43; Wiessner, "Rights and Status of Indigenous Peoples," p. 99; Lerner, Group Rights and Discrimination, p. 112. John A. Mills, "Legal Constructions of Cultural Identity in Latin America: An Argument against Defining 'Indigenous Peoples,'" Texas Hispanic Journal of Law and Policy, Mar. 2002, p. 57. U.N. media release, New York, Sept. 13, 2007. Miguel Alfonso Martinez, "Human Rights of Indigenous People: Study on Treaties, Agreements and Other Constructive Arrangements between States and Indigenous Populations," 1999, E/CN.4/Sub.2/1999/20, paras. 78, 91. United Nations Declaration on the Rights of Indigenous Peoples, G.A. Res. 61/295, U.N. doc. A/RES/61/295, Sept. 13, 2007. See, for example: José R. Martinez Cobo, "Study of the Problem of Discrimination against Indigenous People," 1987, UN E/CN.4/Sub.2/1986/7/Add.4, p. 29; Ronald Niezen, The Origins of Indigenism: Human Rights and the Politics of Identity (Los Angeles: University of California Press, 2003), p. 19; Wiessner, "Rights and Status of Indigenous Peoples," p. 60. David Maybury-Lewis, Indigenous Peoples, Ethnic Groups, and the State, 2d ed. (Boston: Allayn and Bacon, 2002), p. 6; U.N. Conference on Environment and Development, Rio de Janeiro, June 13, 1992, U.N. Doc. A/CONF.151q/26 (vol. 3) at 16 annex 2 (1992), chap. 26, quoted in Anaya, Indigenous Peoples, p. 315. Anaya, Indigenous Peoples, p. 5. Daes, "Indigenous Peoples," p. 9. Andrew Erueti, "The Demarcation of Indigenous Peoples' Traditional Lands: Comparing Domestic Principles of Demarcation with Emerging Principles of International Law," Arizona Journal of International and Comparative Law, 23 (2006): 544; Ruth Kark, "Land-God-Man: Concepts of Land Ownership in Traditional Cultures and in Eretz Yisrael," in Alan R.H. Baker and Gideon Biger, eds., Ideology and Landscape in Historical Perspective (Cambridge: Cambridge University Press, 1992), pp. 63-82. Lerner, Group Rights and Discrimination, p. 113; Thornberry, International Law and the Rights of Minorities, p. 331. Dorothy L. Hodgson, "Becoming Indigenous in Africa," African Studies Review, 3 (2009): 7. Indigenous Peoples in Africa: The Forgotten Peoples? The African Commission's Work on Indigenous Peoples in Africa (Banjul, Gambia: African Commission on Human and Peoples' Rights and Copenhagen: International Work Group for Indigenous Affairs, 2006), p. 13. For general and Bedouin-related arguments, see Geremy Forman and Alexandre Kedar, "Colonialism, Colonization, and Land Law in Mandate Palestine: The Zor al-Zarqa and Barrat Qisarya Land Disputed in Historical Perspective," Theoretical Inquiries in Law, 4 (2003): 496-534; Aref Abu Rabia, "Displacement, Forced Settlement and Conservation," in Dawn Chatty and Marcus Colchester, eds., Conservation and Mobile Indigenous Peoples: Displacement, Forced Settlement, and Conservation (London: Berghahn, 2002), pp. 202-11; Oren Yiftachel, "Likrat Hakara Be-kfarey Ha-Beduim Tihnun Metropolin Beer-Sheva mul Vaadat Goldberg," Tichnun, 11 (2009): 56-71. Moshe Gil, A History of Palestine, 634-1099 (Cambridge: Cambridge University Press, 1997), pp. 23-40. Efraim Karsh, Islamic Imperialism: A History (New Haven: Yale University Press, 2006), pp. 9-20. Ira M. Lapidus, "Tribes and State Formation in Islamic History," in Tribes and State Formation in the Middle East, Philip S. Khoury and Joseph Kostiner, eds. (London and New York: I.B. Tauris, 1991), pp. 42, 44. Abraham Sochowolski, Adam—Adama Mishpat—Safa (Tel Aviv: Hagigim, 2001), p. 74. Pliah Albek and Ran Fleisher, Diney Mekarkein Be-Israel (Jerusalem: Albek and Fleisher, 2005), p. 7; Daniel Friedmann, "The Effect of the Foreign Law on the Law of Israel: Remnants of the Ottoman Period," Israel Law Review, 10 (1975): 196. Bernard Joseph, "Palestine Legislation under the British," Annals of the American Academy of Political and Social Science, 164 (1932): 39-46. Law and Administration Ordinance, Provisional Council of State, Tel Aviv, May 19, 1948. Emanuel Marx, "The Tribe as Subsistence Unit: Nomadic Pastoralism in the Middle East," American Anthropologist, June 1977, p. 345. Clinton Bailey, Ha-Beduim (Sede-Boqer: Midreshet Sede-Boqer, 1969), pp. 1, 6. Toviyah Ashkenazi, Ha-Beduim Be-Eretz Yisrael (Jerusalem: Reuben Mass Publishing House, 1957), p. 30; Joseph Ben-David, Ha-Beduim Be-Yisrael—Hebetim Hevratiyim Ve-Karkaiim (Jerusalem: Jerusalem Institute of Israel Studies, 2004), pp. 36, 57-9, 424-81; Reuven Aharoni, The Pasha's Bedouin (London and New York: Routledge, 2007), pp. 30-1. Moshe Sharon, "Ha-Beduim Be-Eretz Yisrael Bameot Ha-Shmone Esre Ve-Ha-Tsha-Esre," M.A. thesis, The Hebrew University of Jerusalem, 1964, pp. 21-4. Gideon M. Kressel and Reuven Aharoni, "Masaey Uhlusim Memitzrayim La-Levant Bameot Ha-19 Ve-Ha 20," Jama'a, 12 (2004): 206-45; telephone interview with Gideon Kressel, Mar. 8, 2012. Wolf-Dieter Hütteroth and Kamal Abdulfattah, Historical Geography of Palestine, Transjordan and Southern Syria in the Late 16th Century (Erlangen: Palm and Enke, 1977), p. 3. Clinton Bailey, "Dating the Arrival of the Bedouin Tribes in Sinai and the Negev," Journal of the Economic and Social History of the Orient, 28 (1980): 21-4; idem, "The Negev in the 19th Century," Asian and African Studies, 14 (1980): 42, 45. Sharon, "Ha-Beduim Be-Eretz Yisrael," p. 49; Joseph Ben-David, "Od Al Ha-Konflict Ha-Karkai bein Beduei Ha-Negev Levain Ha-Medina," Karka 44 (1998): 64; Emanuel Marx, Ha-Hevra Ha-Beduit Ba-Negev (Tel Aviv: Reshafim, 1974), p. 15; Emanuel Marx, Bedouin of the Negev (Manchester: Manchester University Press, 1967), p. 7. Anatoly M. Khazanov, ed., Nomads and the Outside World, 2nd ed. (Madison: University of Wisconsin Press, 1994), p. 199; Aref al-Aref, Bedouin Love Law and Legend: Dealing Exclusively with the Badu of Beersheba (Jerusalem: Cosmos, 1944; repr. 1974), p. 202; Ben-David, Ha-Beduim Be-Yisrael, p. 17; Hütteroth and Abdulfattah, Historical Geography, p. 11. Avraham Granovski, Ha-Mishtar Ha-Karkai Be-Eretz Yisrael (Tel Aviv: Dvir, 1949), p. 32; David H.K. Amiran, "The Pattern of Settlement in Palestine," Israel Exploration Journal, 3 (1953): 69; see, also, Hütteroth and Abdulfattah, Historical Geography, p. 62; Muhammad Yusuf Sawaed, "Ha-Beduim Be-Eretz Yisrael Bein Ha-Shanim 1804 and 1908," M.A. thesis, Bar-Ilan University, Ramat Gan, 1992, p. 147-9; Eliahu Epstein, "Bedouin of the Negeb," Palestine Exploration Fund Quarterly, 71 (1939): 59-78. Claude R. Conder, Tent Work in Palestine (London: A. P Watt, 1895), p. 271. Ashkenazi, Ha-Beduim Be-Eretz Yisrael, p. 23; Marx, "The Tribe as a Unit of Subsistence," p. 348. Avinoam Meir, "Hithavut Ha-Teritorialiyut Be-Kerev Bedvey Ha-Negev Bama'aver Me-Navadut le-Hityashvut Keva," Mehkarim Be-Geographiya shel Eretz Yisrael, 14 (1984): 76. Gideon M. Kressel, Joseph Ben-David, and Khalil Abu-Rabi'a, "Changes in the Land Usage by the Negev Bedouin since the Mid-19th Century: The Intra-Tribal Perspective," Nomadic People, 28 (1991): 29. A. Allan Degen, Roger W. Benjamin, and Jan C. Hoorweg, "Bedouin Households and Sheep Production in the Negev Desert, Israel," Nomadic People, 1 (2000): 130, 142. H. V. Muhsam, "Sedentarization of the Bedouin in Israel," International Social Science Journal, 4 (1959): 542. Eliezer Goldberg, et al., Din Ve-Heshbon Ha-Vaada Le-Hatzaat Mediniut Le-Hasdarat Hityashvut Ha-Beduim Ba-Negev (Jerusalem: Medinat Israel, 2008), p. 39. Hawashla ve-Aherim Neged Medinat Yisrael ve-Aherim, Court of Appeal, 21 8/74, 38(3) P.D. 141; Justice Tute, "The Law of State Lands in Palestine," Journal of Comparative Legislation and International Law, 3rd series, 4 (1927): 165-82. Aref al-Aref, Toldot Be'er Sheva Ve-Shvateha: Shivtey Ha-Beduim Bemahoz Be'er Sheva (Jerusalem: Ariel, 2000), photocopy of first edition, Tel-Aviv: Bustenay, 1937, p. 273. See the statement of Hussein el-Rifaaya to the committee headed by Justice Goldberg, Goldberg et al., Report, session of Feb. 7, 2008. Conder, Tent Life, p. 71. Ben-David, Ha-Beduim Be-Yisrael, pp. 21, 29. Musa el-Hujeirat, "Ha-Zehut Ha-Kolektivit Shel Ha-Beduim Be-Eretz Yisrael," Reshimot Be-Nose Ha-Beduim, 35 (2003): 6. Ben-David, Ha-Beduim Be-Yisrael, p. 21. Khalil Abu Rabia, Shlosha Maagalim Badin: Ha-Konflict Bein Ha-Minhag Ha-Bedvi, Hukey Ha-Sharia Ve-Hok Medinat Yisrael (Beersheba: Ben-Gurion University of the Negev, 2011), pp. 13-4; Clinton Bailey, Bedouin Law from Sinai and the Negev: Justice without Government (New Haven: Yale University Press, 2009), pp. 300-1. Alexandre Kedar, "Land Settlement in the Negev in International Law Perspective," Adalah's Newsletter, Dec. 2004, pp. 1-7; Elana Boteach, "The Bedouins in the Negev as an Indigenous Population: A Report Submitted to the UN Working Group on Indigenous Populations," The Negev Coexistence Forum Newsletter, Beersheba, Sept. 2005, p. 2; Ismael Abu Saad, "The Education of Israel's Negev Bedouin: Background and Prospects," Israel Studies, 2 (1997): 21-39; "Off the Map," Human Rights Watch, New York, Mar. 30, 2008, pp. 78-80; James Anaya, "Report by the Special Rapporteur on the rights of indigenous peoples," A/HRC/18/35/Add.1, Aug. 22, 2011. See Seth Frantzman, Havatzelet Yahel, and Ruth Kark, "Contested Indigeneity: The Development of an Indigenous Discourse on the Bedouin of the Negev, Israel," Israel Studies, Spring 2012, pp. 78-105. Allen Z. Hertz, "Aboriginal Rights of the Jewish People," American Thinker, Oct. 30, 2011. Related Topics: History, Palestinians | Seth J. Frantzman | Summer 2012 MEQ receive the latest by email: subscribe to the free mef mailing list This text may be reposted or forwarded so long as it is presented as an integral whole with complete and accurate information provided about its author, date, place of publication, and original URL.